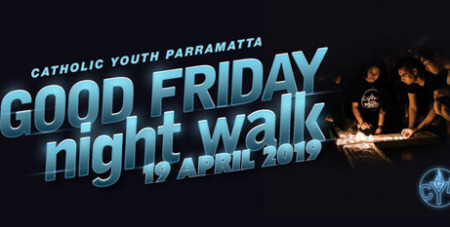 More than 1500 pilgrims, mostly young people, are expected to take part in the Good Friday night walk through Parramatta Diocese this week. Source: Catholic Outlook. On Good Friday, April 19, beginning at 10pm and going through to the early hours of Holy Saturday morning, hundreds of young people will walk almost 20 kilometres and reflect on the Stations of the Cross within a contemporary context. “Every year, we ask people to stand if they are someone who has never done the Good Friday walk before, and every year, at least 60 per cent of the crowd are brand new,” James explained. The new route will start at St Patrick’s Parish, Guildford, and will journey through Holy Family Parish, East Granville, Holy Trinity Parish, Granville, St Margaret Mary's Parish, Merrylands and St Oliver Plunkett's Parish, Harris Park to arrive at St Patrick’s Cathedral. The traditional route begins at St Patrick’s Church, Blacktown, and will travel to Our Lady of Lourdes Parish, Seven Hills, St Anthony of Padua Parish, Toongabbie, Our Lady of Mount Carmel Parish, Wentworthville and Sacred Heart Parish, Westmead before reaching St Patrick’s Cathedral.